A.S. Tilley Garage Ltd of Lewes Road in Brighton, Austin Morris car dealers. Homepage. This page: A job is offered at this motor engineer's located on Lewes Rd in Brighton, March 1950. 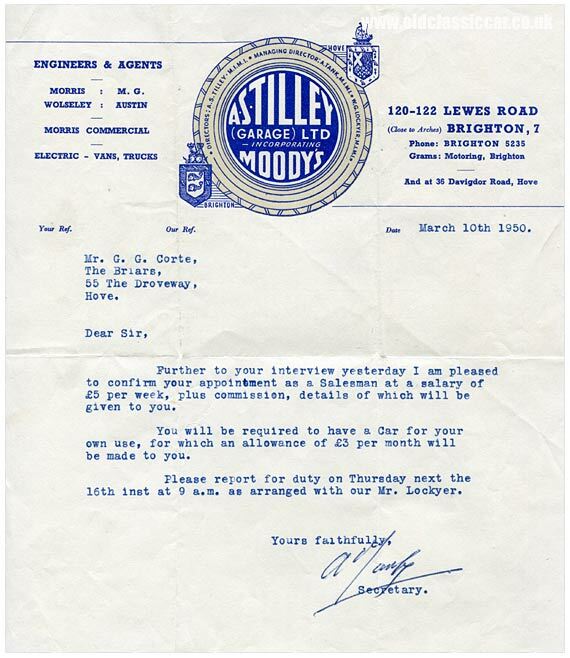 March 10th 1950 was a happy day for a Mr G. G. Corte of Hove, as it was on this day that he received the following letter, offering him a job at A.S. Tilley's garage on Lewes Rd in Brighton. Paying 5 GBP per week (plus commission), he was offered the position of salesman for the company's range of vehicles. A further 3 GBP would be made available on a monthly basis, for the running of a motor-car to use in line with his work. The letterhead lists the following new vehicles as being available in their showroom, although in 1950 most new cars produced in Britain were heading overseas to bring in much-needed finances to the country. The stylish letterheading incorporates a tyre, around the circumference of which is listed the company's management team, namely the Director, A.S. Tilley, and Managing Directors A. Tank and W.G. Lockyer, the latter being the gent to whom Mr Corte had to report on Thursday 16th. In addition to the premises at 120-122 Lewes Road in Brighton, there is also mention of an operation at 36 Davigdor Road, Hove. The premises from which Tilley garage operated on Lewes Road are still used for motor-related activities, the current occupiers being Kwik Fit. Davigdor Road is a residential street; there are two small blocks of flats at the location referred to, which look like they could date from the 1960s, so may well have been built on the site of a second garage building. Documents found online suggest that the business was formed in 1936, from the liquidated remains of a previous company by the name of Hayman and Milton Limited. The letterheading also refers to "Moody's", perhaps another automotive business that was merged with Tilley's at some point? An advertisement for Tilley's also appears on the back cover of the 1948 Brighton Hillclimb race programme I have featured here.